India and Australia now head to the iconic MCG, Melbourne for the 2nd T20. In the first encounter, the hosts just edged past the visitors. It’s now or never for team India as another loss would mean curtains to their chances in the series. On the other hand, Australia would look to seal the series with another win. Keep reading to find out the India vs Australia 2nd T20 Match Prediction. It was a rain-affected game at Gabba as Australia’s 158 was revised to 174 as a target for India. The DLS method benefitted Australia more than India. But credit must be given when it’s due. The hosts batted well. Chris Lynn, Glenn Maxwell and Marcus Stoinis were outstanding. However, the Indian bowling and fielding were rusty. The Men in Blue dropped crucial catches and the likes of Khaleel Ahmed and Krunal Pandya went for plenty. Two big guns, Rohit Sharma and Virat Kohli failed with the bat. As a result, the batting was in disarray. Shikhar Dhawan and Dinesh Karthik’s efforts went in vain. But the visitors should bounce back strong. They have a streak of 7 continuous series wins and would fight hard to level the series in Melbourne. 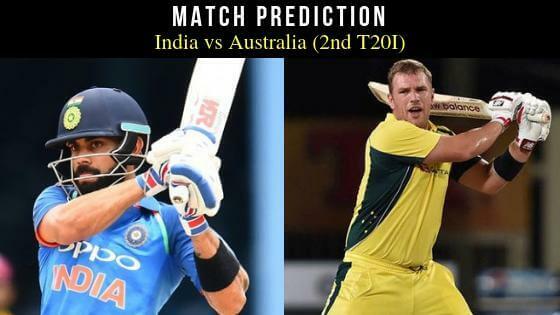 India vs Australia 2nd T20 Match Prediction: Some lackluster batting led to India’s downfall in the first game. But the kind of batting line-up that they possess, it’s difficult to count them out just yet.